With our VPS and Dedicated Hosting plans you can automatically perform cPanel backups. This allows you to schedule and save regular backups of your accounts to your server or an external destination such as Amazon, Google Drive, or FTP. 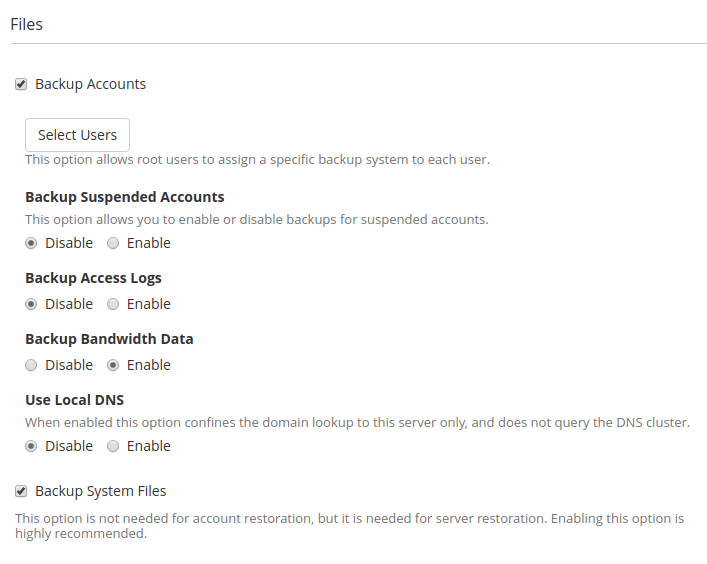 In this tutorial, we will show you how to Configure cPanel Backups in WHM. Keep in mind it uses disk space if you save backups to the server. Due to this we recommend downloading and storing them in another location such as an external drive or local computer. This also protects the backups in case of server issues, since you have them saved to another location. You can always purchase our auto backup service within your AMP, which provides a rolling 24-hour backup. This means that only the previous day will be on the backup should you need access to it. While this is good for development and emergency restorations, you may want to save monthly, weekly, or even daily backups on your own. Note: You will need root access to complete this guide. Log into WHM as the "root" user. 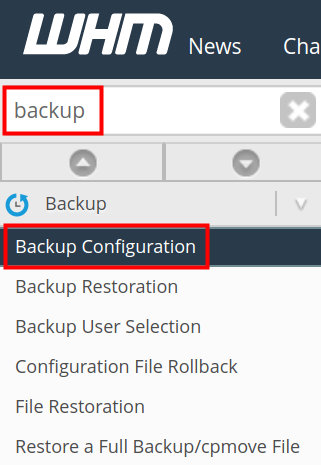 Type 'backup' in the search field, then click on the Backup Configuration option the Backup. 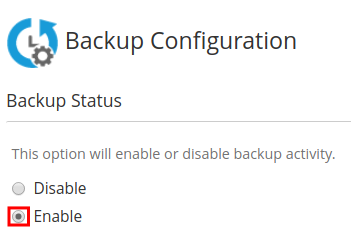 In the Backup Status section click the Enable option. 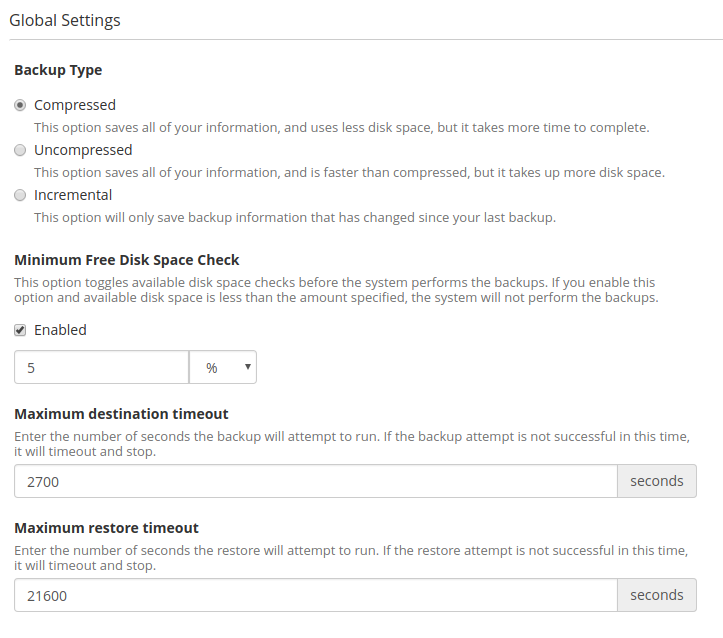 You will then have additional options available for configuring your backups. Choose one of the options to define how the server will store the backup. Saves all information in compressed file. This takes more time but uses less disk space. Saves all information in an uncompressed format. This uses more disk space but is faster. Stores only one uncompressed file. It saves only updated information and replaces that. This limits the restoration settings but is faster and uses the least disk space. You can set a disk space check here in Percentages (%) or Megabytes (MB). If you have less than the alloted space the backup will not run. The amount of time a backup process allows to upload a single backup file. The amount of time a backup process allows to upload a restore a backup file. Set your Scheduling and Retention preferences. Creates a new backup on each selected day. You must configure the days and the number of retained backups (1-9999). Creates a new weekly backup on the day selected. 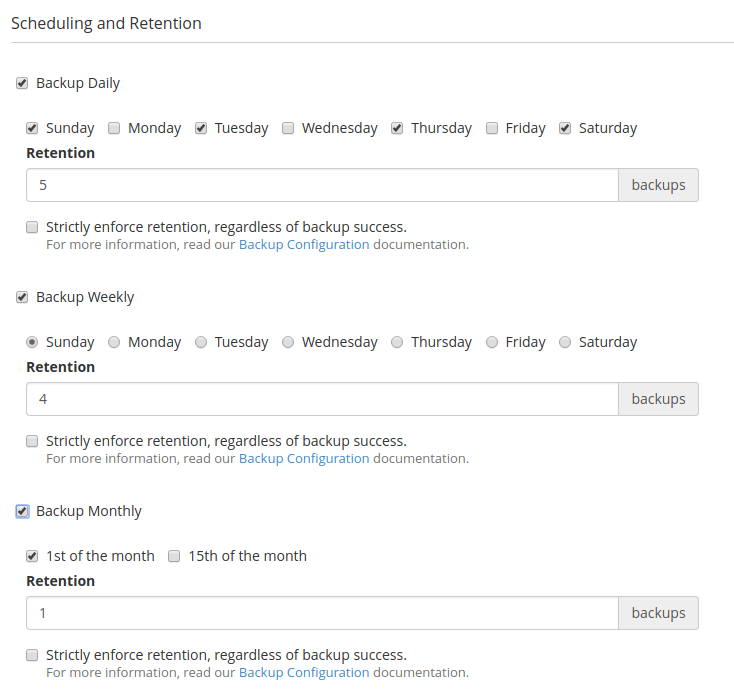 You must configure the days and the number of retained backups (1-9999). Select this box to enable user accounts to be backed up. From there you can need to configure the following settings. Allows you to select specific users to back up. Choose if you want to backup Suspended Accounts by enabling or disabling this option. Choose if you want to enable or disable backups for Access Logs. Enabling this will backup the bandwidth data from your server. According to cPanel "When enabled this option confines the domain lookup to this server only, and does not query the DNS cluster." Select this box if you wish to backup system files. This is for server restoration and not for account restoration. It is highly recommended to enable this setting. Set your Database backup settings. 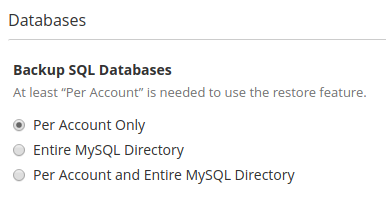 Back up the databases for each account using the mysqldump utility. Back up all of the databases on the server by backing up the /var/lib/mysql/ directory. Performs backups of all databases in each account and all databases on your server. Set to /backup/ by default, you can change it by entering the absolute path to your preferred directory location. If selected, keeps a copy of the backup in the backup directory even after transferring the backup to another destination. If not selected, the copy will be deleted after the transfer. Select the Enable button to mount a backup drive. The server will check /etc/fstab/em> for another mount point. If disabled (default) the server will not check. Set up your Additional Destinations if desired, each destination has its own setup configuration. 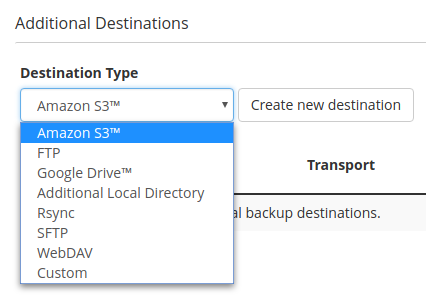 Options are Amazon S3, FTP, Google Drive, Additional Local Directory, Rsync, SFTP, WebDAV, and Custom. Click the Save Configuration button. Congratulations, now you know how to Configure cPanel Backups in WHM! Did you find this tutorial helpful? There's more where this came from! InMotion Hosting's world-class support is availabe 24/7 to assist you with all of your web hosting needs. Where can I find the backups to delete them if necessary to save disk space. Running backups through WHM seems to use alot of space. If you are not using a remote location, then you can find the location of your backup in Step 8 per the instructions above. This is the backup directory. If you are still not familiar with the location, then I recommend contacting our live tech support team for assistance. You can see their contact information at the bottom of the page. Is there a way to determine how much disk space the backup will be before running it? Yes, you can use the Minimum Free Disk Space Check feature. See step 4. Hi.Can we change backup hour?It is making backup in my peak hours. Thanks for your question about changing the backup hour with the scheduled backups. You can actually go to the "Configure cPanel Cron Jobs" in WHM and then set the specific hours.